If you are planning on eating at a table service restaurant for dinner at Disney's Hollywood Studios, followed by a viewing of Fantasmic!, consider the Fantasmic! Dinner Package. The Dinner Package includes dinner at one of the Studios restaurants and reserved seating in the Fantasmic! amphitheater. 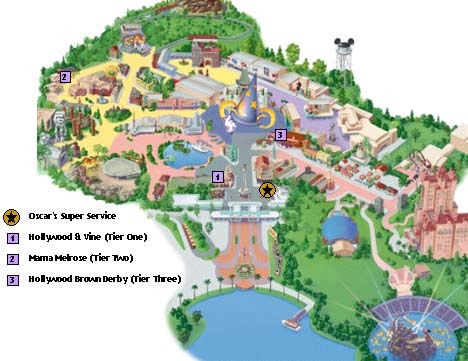 The Brown Derby, Mama Melrose, and Hollywood & Vine are the participating restaurants. Fantasmic! Dining Packages are also available during lunch. However, when there are two shows offered on the same night, the package is valid for the first performance only. Please note prices may vary seasonally. Adults -- $53.99+ (plus tax and gratuity). Children -- $32.99 (plus tax and gratuity). Includes full buffet and dessert. Adults -- $44.99+ (plus tax and gratuity). Includes choice of: Appetizer, Entree, Dessert and Non-alcoholic Beverage. Children -- $-17.99 (plus tax and gratuity). Any meal from the child's menu. Includes entree, dessert, and beverage. Adults -- $62.99+ (plus tax and gratuity). Children -- $-21.99 (plus tax and gratuity). Admission to Disney’s Hollywood Studios is required and is not included in the price of the dining package. You can pick up your VIP voucher for Fantasmic! at the time of your meal. Plan to arrive for Fantasmic! seating at Hollywood Hills Amphitheater 20 to 30 minutes prior to showtime. Show times can be found on the Times Guide at Disney’s Hollywood Studios. Your seats are not assigned. Rather, you choose your seats within the reserved section on a first-come, first-served basis. The entrance for VIP seating is located on Sunset Boulevard next to Beauty and the Beast – Live on Stage. The Fantasmic! Dining Package is available on all Fantasmic! show days. On days with multiple showtimes, reserved VIP seating is available for the first show only. In the event of a show cancelation due to inclement weather, VIP Seating will be made available for an alternative performance within 5 days of the date you were originally scheduled to attend. Valid theme park admission is required. "We used the Fantasmic dinner package the last time we were there and thought it was great. I thought our seats were great and we had a great view of the show. It was absolutely so cool to walk up the secret alley with just a few people and how can you beat just walking right up and sitting down. I don't feel that being dead center or being to the right or left side of the theatre is any better than any other. It's such a great show from any view point. I would highly recommend the Fantasmic dinner package to all." "My husband did the Fantasmic dining package in December and will definitely be doing it again!! It worked out perfect. We ate (around 4:30 I believe) at the Brown Derby which was great as usual. After eating we went to get our seats for Fantasmic. We were the first dinner package people to arrive so we got first pick. The seats were great...and it sure beat standing in line!! Not to mention, when you stand in line, you have to sit where you're told...with the dinner package, you pick your spot in the marked off area." "We did the "waiting in line" the first year, and the Fantasmic Dinner package the second year. 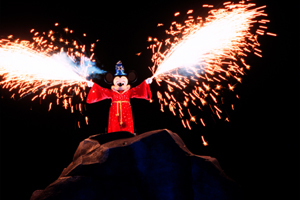 Needless to say, we'll be doing the Fantasmic dinner package again this year! Last year we scheduled our ressies too late - I would recommend 4:30 or 5:00. We did Hollywood and Vine, and the buffet had something for everyone in my family. As far as the seating is concerned, the reserved section is at the right of the amphitheater and is great! I highly recommend it! Just make sure you report to Oscar's with your pass 30-45 minutes before show time." "Definitely do it- it is very worth it. I can not see wasting 2 hrs of my day waiting in line- with the dinner package you get a great meal and then a guaranteed seat at Fantasmic!" "We do the dinner package every time we go and have been very happy with it. While the comments about sitting nearer the top to stay dry are true, if it is a really windy day, you can still get wet even at the top. "